Print advertising comes in a variety of forms: brochures, coupons, fliers, business cards, billboards, and magazine or newspaper ads. Print ads are thought to be outdated, but brands like Ikea are still seeing incredible benefits from using catalogues and print media marketing. If you want to benefit from print ads or are considering using print ads as part of your marketing strategy, you should be aware of the basic elements of the medium. Here are the most important elements of print ads you should know about. Before you create your print ad, you should think of what kind of customer you want to target. The more you know about your customers, the better you can position your marketing message to reach out to them and create engagement and interest. Also known as the title, the header is a catchy phrase that draws a reader’s attention to your ad and lets them know what they will find in the copy. The header should point to a key benefit the ad describes, whether it be a discount sale or a limited-time offer. It may also propose a solution to a problem the reader could potentially have. The header is usually the strongest element of a print ad, as it determines whether the reader spends time reading the ad or not. Another common element of a print ad is the body section, which is the main part of the ad. This section digs into the concept of the title, providing interesting information about the product, service, or subject. This element should be well-organized and straight to the point. You can use bullet points or subheads when necessary to make the important parts of the ad understandable. A recent study showed that consumers are more attracted to images than words. Take magazines, for example—the content has changed significantly over the years. Now, more and more pages are corner-to-corner photographs of models showcasing a garment, piece of jewelry, or makeup. Readers spend more time observing the details of these large photos than they do reading the articles in the magazines. This indicates that people value visuals, and you should take advantage of images to target your audience and keep their attention. Photography, illustration, and other visual elements are a very important part of an ad. They create curiosity and indicate what the viewer will learn about if they read your ad. Like the header, these elements attract the reader to your ad and can be the factor that makes them read on. In newspapers, pictures are generally in black and white, but color images can make your ad stand out from the rest of the content on the page. Make sure your image is relevant to the subject you are talking about in your ad for maximum effect. If your headline and image or illustration are inconsistent, you will confuse your reader and reduce the impact of your ad. Following the ad copy is your call to action (CTA). This section guides the reader to take a specific action, such as making a phone call to learn more, visiting the physical or online store, or staying up-to-date on your new products by following you on social media. The CTA is designed to create a sense of urgency in the reader, subconsciously making them want to act before the offer expires. Phrases like “call today” or “this offer expires” direct the reader to respond to your ad immediately. There’s no point in making an ad without letting your customer know who you are and how they can contact you. Your contact information is a vital element of your print ad as it tells the reader how they can call, email, text, or visit your store (physical or online). Now that you have all the elements of your ad accounted for, it’s time to create a layout. The layout is the way you put all these elements together to create your final product. Your layout should have a focal point, and it should be either your header or the main image. This will encourage the reader to get drawn in. Then the white space, text, and secondary graphic elements should lead them through the body of the ad to the CTA and contact information. Print media advertising continues to provide advantages for brands around the world, so if you want to benefit from the same advantages, now is the time to change things up. The medium is alive and well, and big brands are still posting ads in newspapers and magazines to connect with their target audiences. You should take this opportunity in the new year to improve your marketing strategy by incorporating the use of print media advertisements. It doesn’t take much to make your ad campaign inspiring and creative as you promote your products or services. Standing out from the crowd and engaging readers is essential to growing your customer base and getting them to visit your store or web site. If you want to experience the advantages of a successful print media strategy, you may want to seek direction from the experts. 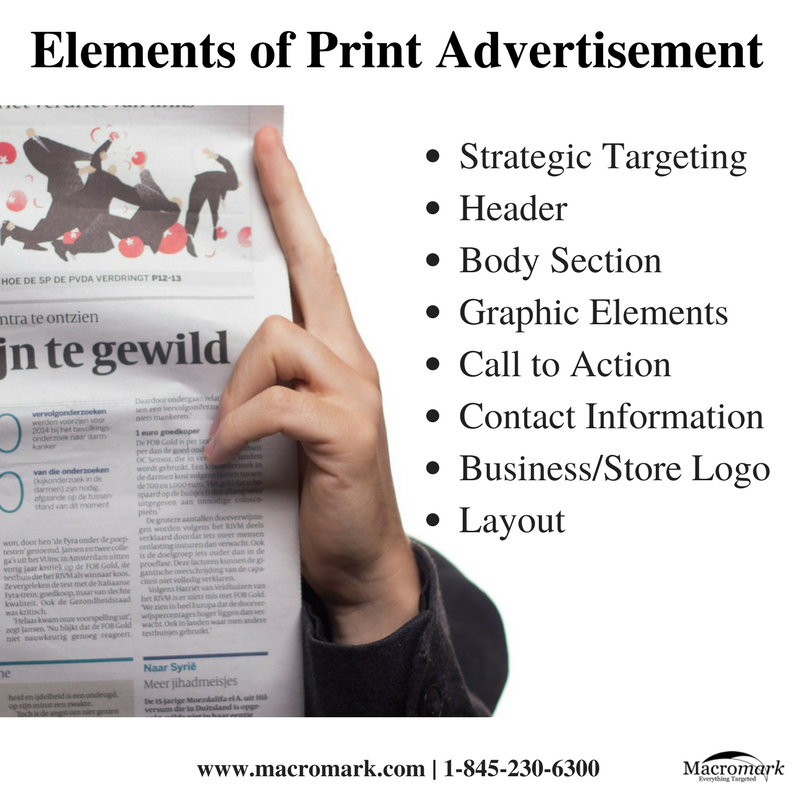 Macromark can help you set up a successful print advertisement campaign. We can provide all the information, advice, and assistance you need to get your print catalog marketing campaign up and running. Our services also include print media, direct mail marketing, list brokerage, data solutions, list fulfillment, and list management. For more information about how we can help grow your business, contact us at 1-(845)-230-6300.